As another shutdown looms large, I wonder how we lost our taste for solving complex problems in rational and effective ways. Or maybe we’ve lost the skill. Humans have been capable of using high-level cognitive abilities to weigh alternatives and devise creative solutions to complex problems for eons. Yet our esteemed leaders have forgone those capabilities and chosen to adopt playground level either-or, line-in-the-sand wrangling at a tremendous cost to everyone, including themselves. So even though I know they are not listening, I offer the following set of principles and approaches for addressing the Immigration/Border Security problem effectively, enduringly, and in a way that most of us can accept. Assemble a set of facts relative to the situation that are considered valid by all decision makers. Information should be provided by neutral entities and vetted until all can accept. Provide an opportunity for everyone to express their views, concerns, beliefs, etc. while being listened to without interruption. All are encouraged to keep an open mind and listen only for understanding and to learn why people feel the way they do. Stories and testimonials representing a wide range of experiences should be shared. A discussion is not allowed during this, just speaking and listening. Given all that has occurred to this point, groups are formed to generate specific proposals for creating the desired outcome. Creativity is encouraged. As ideas are shared, new proposals are generated that represent the best thinking of all. Proposals are weighed against their potential to bring about the desired outcome. Decision makers work together to consider costs, consequences, and the ability to implement various proposals. They choose the best ones to craft into proposed legislation. I’m not suggesting this is easy to do, but it is possible, and it can work. Is it too rational? Maybe! 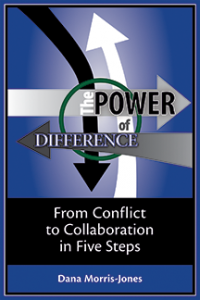 Dana Morris-Jones is the author of The Power of Difference: From Conflict to Collaboration in Five Steps.